The business corporation registry of the Maryland Secretary of State acts as the record center for all those corporate entities that are or were headquartered in the state. The registry holds filing and authorization information of every commercial enterprise that is incorporated in the state, whether it be a Corporation, Limited Liability Company, Limited Company, Limited Partnership or Limited Liability Partnership. Below is a step by step guidelines on how to use the Maryland business search page. 1. The first step is to access the Maryland business search page by clicking here. (it will look similar to the screenshot below). 2. The next step is to fill out the form. You can search by business name or by department ID. For this example we will be searching by name. 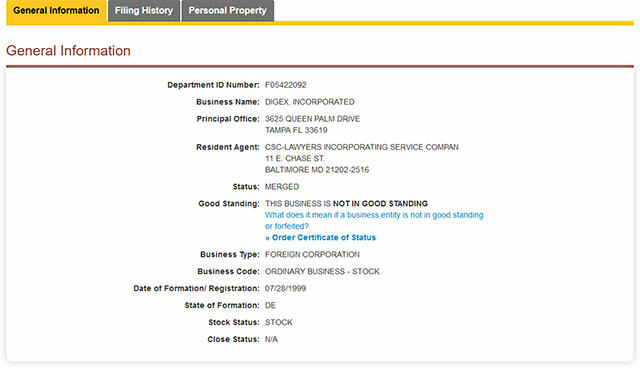 Go ahead and type in the name "Digex" in the "Business Name" field and click the "Search" button. 4. Click on "Search" button and the Results Page with a list of business entities carrying the name, ID, details and status will appear. 5. Click on "General information", "Filing History" or "Personal Property" to access more information on the entity. Please note, the online search tool for finding registered entities in Maryland lets you gather any information on any business entity registered in the state. Whether an entity is dissolved, incorporated, forfeited or active, you can access all their information with a click. You can also register new entities, as well as file annual reports in their website. The Secretary of State of Maryland is a constitutional office in the state. The Secretary of State is not elected, but appointed by the Governor of Maryland. The present Secretary of State of Maryland is John P. Wobensmith. 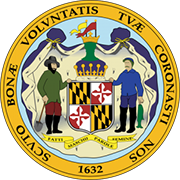 The Secretary of State of Maryland is the custodian of the Great Seal of the State of Maryland and the guardian of the public records and public archives. The Secretary of State of Maryland is responsible for an array of administrative functions of the state, including the issuance of licenses and notarization of public documents.